Tesla innehar över 700 patent världen över. De som är listade här är de första som är registrerade i USA. En PDF-fil med en lista över patenten finns att ladda ner här. 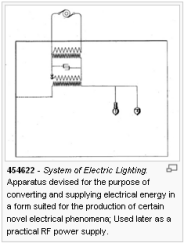 U.S. Patent 0,390,413 - System of electrical distribution - 1888 October 2 - Related to previous electric distribution systems developed by Dr. Tesla; Examples of systems in operation with motors or converters, or both, in parallel; Examples of systems in parallel; Examples of systems in series. U.S. Patent 0,390,414 - Dynamo Electric Machine - 1888 October 2 - Related to the patents of Dr. Tesla and Charles F. Peck, numbers: US381968 and US382280; Ordinary forms of continuous and alternate current systems may be adapted to Dr. Tesla's system, with slight changes to the systems; Effects their forms; Only the best and most practical solutions are presented to the three most common forms of the devices applicable; Illustrated are the continuous (or closed) circuit machines, machines possessing armatures with coils connected diametrically (known as "open-circuits"), and machines with armature-coils of which have a common joint. U.S. Patent 0,433,700 - Alternating-Current Electro-Magnetic Motor - 1890 August 5 - Rotation of an electromagnetic motor is produced by the magnetic movements or the maximum of the pole's (or point's) magnetic effects from the conjoined actions (or the two energizing circuits) through which alternating currents (or similar rapidly-varying currents) are passed through; Multiple magnets are powered by artificial currents; Inverse strength of magnetism on stator for best rotation; Creates multiple phases through one circuit from one power source. U.S. Patent 0,454,622 - System of Electric Lighting - 1891 June 23 - Apparatus devised for the purpose of converting and supplying electrical energy in a form suited for the production of certain novel electrical phenomena, which require currents of higher frequency and potential. 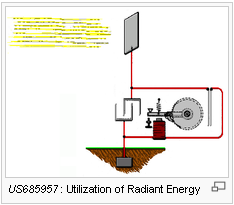 It specifies an energy storage capacitor and discharger mechanism on the primary side of a radio-frequency transformer. This is the first-ever disclosure of a practical RF power supply capable of exciting an antenna to emit powerful electromagnetic radiation. 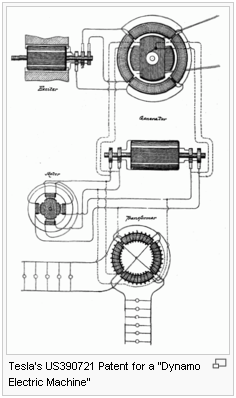 U.S. Patent 0,487,796 - System of Electrical Transmission of Power - 1892 December 13 - Alternating current generator comprising independent armature-circuits formed by conductors alternately disposed; Currents developed differ in phase and the field magnet poles in excess of the number of armature-circuits; Motor having independent energizing circuits connected to the armature-circuit of the alternating current generator; Rotating magneto-electric machine yielding a given number of current impulses or alterations for each turn or revolution; Poles which in number are less than the number of current impulses produced in each motor-circuit by one turn or revolution; Multipolar alternating-current machine. 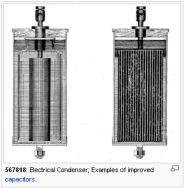 U.S. Patent 0,511,916 - Electric Generator - 1893 August 19 - Combination with the piston or equivalent element of an engine which is free to reciprocate under the action thereon of steam or a gas under pressure, of the moving conductor or element of an electric generator in direct mechanical connection; Engine and generator being adjusted by their relative adjustment with respect to period to produce currents of constant period; Electric generator having inducing or induced elements one of which is capable of oscillation in the field of force, the movable element being carried by the piston rod of the engine; Relation as to respect of period of electrical vibration will not disturb the period of the engine; Cylinder and piston reciprocating by steam or gas under pressure of a spring maintained in vibration by the movement of the piston, and the electric generator, the movable conductor or element of which is connected with the piston; Method of constructing and adapting elements; Imparting the oscillation of an engine to the moving element of an electric generator and regulating the period of mechanical oscillation by adjustment of the reaction of the electric generator. 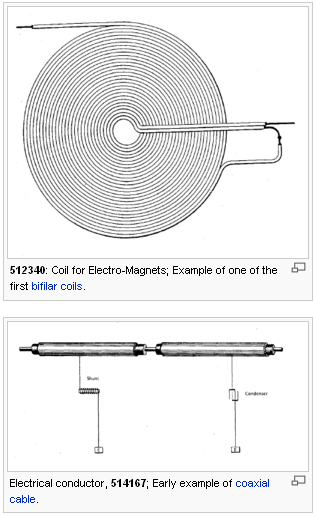 U.S. Patent 0,512,340 - Coil for Electro-Magnets - 1893 July 7 - Effect of mutual relation self-induction exploited; Adjacent coil convolutions formed parts exists so that the potential difference is sufficient to neutralize negative effects; Object to avoid expensive, cumbersome, and difficult condensers; Bifilar coil winding technique. U.S. Patent 0,514,169 - Reciprocating Engine - 1893 August 19 - Provide a means of engines, which under the applied forces such as elastic tension of steam or gas under pressure, that will yield constant oscillatory movements (in wide limits); Function is constant irrespective of the loads, frictional losses, or other factors (which degrade other engines); Convert pressure into mechanical power; Better at higher temperatures and pressures than previous engines; Same principles of this engine appear later in the modern gasoline motors of automobiles. 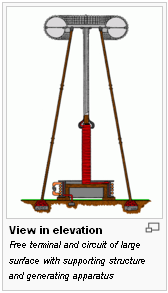 U.S. Patent 0,517,900 - Steam Engine - 1893 December 29 - Cylinder and reciprocating piston (with a spring) and controlling slide valve of an engine adapted to be operated by steam or a gas system under pressure of an independently controlled engine of constant period operating the said valve. 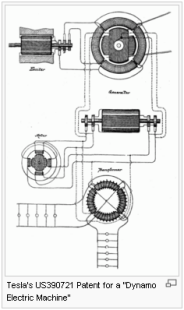 U.S. Patent 0,568,178 - Method of Regulating Apparatus for Producing Electric Currents of High Frequency - 1896 September 22 - Cited by Tesla in "the True Wireless" (illustrated in that article as Fig. 10) in the wireless field for the concatenated tuned circuits; regulates the energy delivered by a system for the production of high-frequency currents and comprising of a supply-side circuit whose current is diverted into a charging circuit of high self-induction, a condenser (charged by the supply circuit), another circuit (with low self-induction) which the same discharges through (and raises the potential of the condenser), and means for controlling the charging and the discharging of same, the said method consisting in varying the relation of the varying frequencies of the impulses in the circuit comprise the system. U.S. Patent 0,568,180 - Apparatus for Producing Electrical Currents of High Frequency - 1896 September 22 - an isochronous mechanical break used in the laboratory at New York, 35 South Fifth Avenue lab for employing currents of different; patent covers possible variations within Tesla's wireless systems; a combination with a source of alternating current, of a condenser adapted to be charged thereby, a circuit into which the condenser discharges in a series of rapid impulses and in synchronism with the source, and a circuit-controller for effecting the charge and discharge of said condenser, composed of a set of sub-divided conductors (a pair of angularly-adjustable terminal and two or more rotating conductors) moveable into and out of proximity with (eg., passing by) each other, whereby a spark may be maintained between them and the circuit closed thereby during determined intervals. U.S. Patent 0,609,250 - Electrical Igniter for Gas Engines - 1898 August 16 - Ignition system principles used today in automobiles; Operation of a machine that requires a spark, flame, or any other similar effect; More certain and satisfactory for use of and control by the machine or apparatus; Charging and discharging a condenser through switch or communicator. U.S. Patent 0,613,809 - Method of and Apparatus for Controlling Mechanism of Moving Vehicle or Vehicles - 1898 July 1 - Tesla "Boat" patent; First logic gate; Art of controlling the movements and operation of a vessel or vehicle at a distance; Electromagnetic waves conveyed to vessel by the natural media and rendering by their means the controlling-circuit active or inactive; New and useful improvements in methods of and apparatus for controlling from a distance; Solution for controlling from a given point the operation of mechanisms; No intermediate wires, cables, or other form of electrical or mechanical connection with the object save the natural media in space; explanation of most practical and effectual method and apparatus; Remote control. U.S. Patent 0,645,576 - System of Transmission of Electrical Energy - 1900 March 20 - Commonly referred to as the radio patent; Related to wireless telegraphy; Wireless transmission of electric power through the natural media; Cites well known radiant energy phenomena and the experiments of William Crooke; Corrects previous errors in theory of behavior when used by the methods and means of Mr. Tesla; Discovery of highly important and useful facts which heretofore have been unknown; Deprive dialectic of air when impressing electromotive forces of a certain character and magnitude unto it; Conductivity of the air increases with the augmentation of the pressure and the rarefaction; Law of conductivity of the air is quite different from heretofore established; Illustrations of the facts. U.S. Patent 0,655,838 - Method of Insulating Electric Conductors - 1900 October 23 - Method and practical application of insulation by freezing and solidification; Expounding on Faraday's hypothesis of freezing substances make them possess a higher dielectric level to insulate transmission conductors; Improvements in the method set out by Faraday; Method of insulating electrical conductors which consist in surrounding or supporting said conductors by a material which acquires insulating properties when frozen or solidified; Method of maintaining a conductor within a gaseous cooling agent by the continuous application of said agent; Trough or conduit with circulating cooling agents; Reissued as U.S. Patent RE11,865 . U.S. Patent 0,685,012 - Means for Increasing the Intensity of Electrical Oscillations - 1900 March 21 - A method for producing a "great increase in the intensity and duration of the (electrical) oscillations excited in a freely-vibrating or resonating circuit by maintaining the same at a low temperature". Producing increase intensity and duration of electric oscillations; Combination of a circuit to possess freely-vibrating excitations and of means for artificially cooling the circuit to a low temperature; Low temperature resonating circuit; Uses of electrical impulse oscillations; A circuit upon which oscillations are impressed, and which is adapted to vibrate freely, in combination with a receptacle containing an artificial refrigerant in which the circuit is immersed; Low resistance oscillators in a series of transmitting and receiving circuits in a system for the transmission of energy. U.S. Patent 0,685,953 - Apparatus for Utilizing Effects Transmitted from a Distance to a Receiving Device through Natural Media - 1899 June 24 - Heinriech Hertz methods cited; Induction method cited; Ground conduction method cited; Previous methods had limitations that result in great disadvantages for utilization; Wireless transmission developed by Dr. Tesla cited; Transmitting station coil arranged and excited to cause arbitrary or intermitted oscillation propagation to another remote point receiver station coil; Air is an excellent insulator; Air strata used for means of conduction for production of generating actions at a distance; Use of metallic conductor; Transmitting apparatus of signals or intelligence should produce effect as strong as possible; Charge a condenser or capacitor to utilize the potential energy. U.S. Patent 0,685,954 - Method of Utilizing Effects Transmitted through Natural Media - 1899 August 1 -Utilizing effects or disturbances transmitted through the natural media, which consists on charging a storage device with energy from an independent source, controlling the charging of said device by the actions of the effects or disturbances (during succeeding intervals of time determined by means of such effects and disturbances corresponding in succession and duration of the effects and disturbances), and coincidentally using the stored energy for the operating a receiving device; Independent source may be at a distant transmitting electrical energy; Receiving device circuit discharges the accumulated stored energy (which may be potential energy) and causing variations in resistance in a circuit including an independent source of electricity and a storage device; Effecting the storage (such as, in a condenser) during any desired time interval and under control of such effects of disturbances; Accumulated energy may operate a transformer (by discharging through a primary circuit at predetermined times) which, from the secondary currents, operate the receiving device. U.S. Patent 0,685,955 - Apparatus for Utilizing Effects Transmitted From A Distance To A Receiving Device Through Natural Media - 1899 June 24 - An apparatus for transmitting signals or intelligence through the natural media from a sending station to a distant point the combination of a generator or transmitter adapted to produce arbitrarily varied or intermitted electrical disturbances or effects in the natural media, and for utilizing electrical effects or disturbances transmitted through the natural media, the combination with a source of such effects of disturbances of a charging-circuit adapted to be energized by the action of such effects or disturbances, between which a difference of potential is created by such effects or disturbances, a storage device included in the charging-circuit and adapted to be charged thereby, a receiver, a means for commutating, directing, or selecting the current impulses in the charging circuit so as to render them suitable for charging the storage device, a device for closing the receiving-circuit, means for causing the receiver to be operated by the energy accumulated in the storage device at arbitrary intervals of time when connecting the receiving-circuit with the storage device for periods of time predetermined as to succession and duration, and means for discharging the storage device through the receiving-circuit at arbitrary intervals of time. U.S. Patent 0,685,956 - Apparatus for Utilizing Effects Transmitted through Natural Media - 1899 August 1 - Related to his Magnifying Transmitter; Used as part of Dr. Tesla's Colorado Spring receivers that posed a distributed high-Q helical resonators, radio frequency feedback, crude heterodyne effects, and regeneration techniques; an apparatus for transmitting signals or intelligence through the natural media from a sending station to a distant point the combination of a generator or transmitter adapted to produce arbitrarily varied or intermitted electrical disturbances or effects in the natural media; combination of a source of electricity, a transformer, a device normally of high resistance but adapted to have its resistance reduced when acted upon by the effects or disturbances, with a receiving circuit connected with a condenser and a deceived adapted to open and close the receiving circuit at predetermined intervals of time. U.S. Patent 0,723,188 - Method of Signaling - 1900 July 16 - Elevated transmitter capacitance; Coil; Earth electrode; Signal generator; Partial basis of radio design. U.S. Patent 0,725,605 - System of Signaling - 1900 July 16 - Elevated transmitter capacitance; Coil; Earth electrode; Signal generator; Apparatus of and method for electrical disturbance or impulses; Transmission of intelligent messages; Govern the movement of distant automata; Radio transmissions; Partial basis of radio design. U.S. Patent 0,787,412 - Art of Transmitting Electrical Energy through the Natural Mediums - 1900 May 16 - Elevated transmitter capacitance; Coil; Earth electrode; Signal generator; Apparatus for generating and receiving electrical signals; Tuned resonant circuits; Physics of propagation; Non-Hertzian notes; Globe as conductor; Low frequency oscillations; Basis of radio. 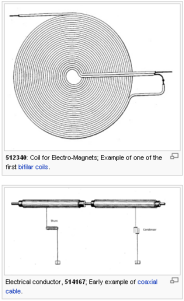 U.S. Patent 1,119,732 - Apparatus for Transmitting Electrical Energy - 1902 January 18 - High-voltage, air-core, self-regenerative resonant transformer; Oscillator for wireless transmission of electromagnetic energy; Tesla coil. U.S. Patent 1,329,559 - Valvular Conduit - 1920 February 3 - Improvement by means of a conduit or channel characterized by valvular action; Conduit has baffles, recesses, projections, enlargements, or buckets that channels the flow's movement one way more efficiently; Mechanical diode; One-way valve with no moving parts.